Multipoint thermocouples are often used for measuring temperature profiles in reactors or fuel depots or for the detection of the so-called “hotspots”. Individual measuring points are stuffed or drawn into an outer protection tube. The measuring points are placed at various levels to suit the application. Depending on customer needs, the protection tube is then assembled with a process connection for direct mounting or inside a guide tube. 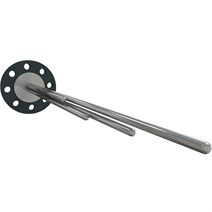 Connection terminals or temperature transmitters are placed in the connection housing which is either a component of the multipoint thermocouple or can be mounted separately, e.g. on a wall or pipeline. These assemblies are used when a temperature profile is desired and mass, or size, of the sensor is a limitation. They can be constructed in a wide variety of configurations to suit the specific application. For example, it is possible in some applications to add a traversing ability to the multipoint thermocouple. This allows for continuous data to be collected over the distance of the traverse stroke. This feature can help gather important information relating to catalyst or process activity. These traversing units can be electrically driven with precise feedback on position.